Laundry done – we have enough to last the rest of the trip – after two nights staying in Farm Resorts at Dickoya, our next stop will be the Athgira River Camp. That should be interesting. First and foremost it does what it says on the can and is on a river, so I’m hopeful of some wildlife. Secondly, our accommodation is said to be tented. Yikes! Many years ago we did a tented safari in the Maasai Mara, Kenya. A comparison should prove interesting. We set off and our journey continued past many more slopes thickly planted with tea bushes. Apparently the bushes, if left untended, would grow to a height of several metres so they are pruned and kept down to 1m to allow for harvesting. Every now and then we would pass a slope with ladies picking the tea. Stopping on a twisting, turning, relatively narrow road is rarely easy/safe but at one field with a group of ladies working, our driver managed to pull in so we could take pictures that were not posed. Even better, this group of ladies did not have garishly branded tea sacks. 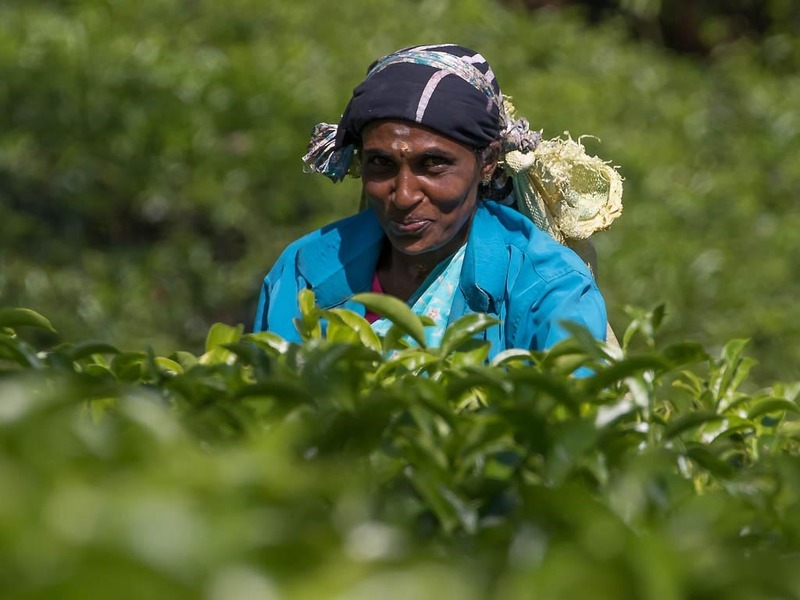 After firing off about 300 shots yesterday in our posed staged shoot, the vast majority of which have been deleted, I think this is the most natural and my favourite tea picking picture. We were bound for lunch and the Elephant Transit Home at Udalwalawa. 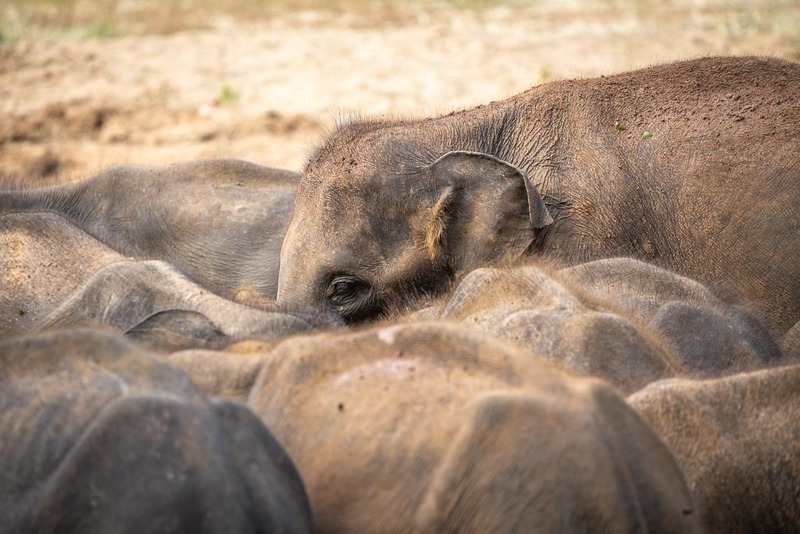 Very like the Sheldrick Wildlife Trust in Kenya, this transit home seeks to look after orphaned young elephants until they can fend for themselves in the wild. Their ultimate destination is the Udawalawa National Park which the home borders and which we will visit tomorrow. 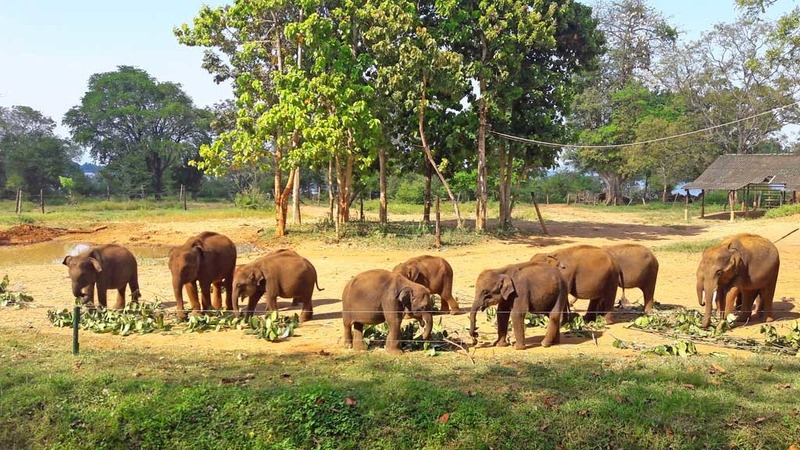 With the orchestrated feeding, it may feel a bit like a zoo except that these elephants are not captive and the home actually does good work. With wire fence strands intervening, it isn’t a situation easily leading to any natural photographs that one might want to keep – Francine did quite well, though – but it was encouraging to see the efforts trying to counteract, in some small way, mankind’s general disregard of the planet. After elephant feeding time, we made our way to the Athgira River Camp. Time was nudging 16:00 when we arrived and I was anxious to get down to investigate the river. Beer would have to wait. [Crumbs, it must be serious.] 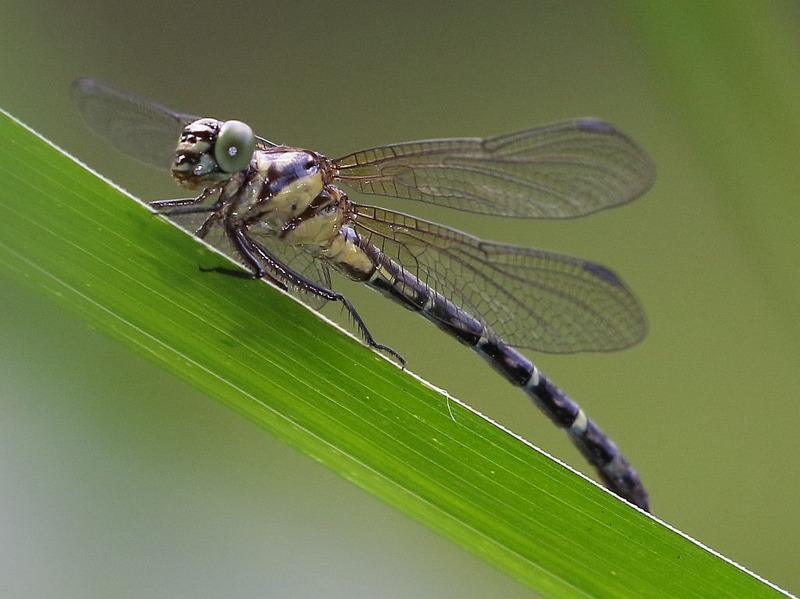 Well, we’ll be heading to the coast tomorrow and this is likely to be my last opportunity for Sri Lankan dragonflies. We checked in and were given a tent/chalet right beside the river. The reason for my describing the accommodation as a tent/chalet is that the sleeping quarters were a (very) heavy duty tent, complete with a protective rush roof, but it was erected up against a permanent concrete-built shower/toilet facility. On the bedroom side of this wall was the electricity supply so necessary for the battery of chargers required by modern travel. The washroom was open to the elements at the roof line. It was therefore also open to any wandering mosquitos and there was no way of completely closing the door from the washroom into the sleeping quarters, hence the three mosquito nets suspended above our three beds, two single and one double. On the electricity supply wall there was also mounted an electric fan. Right, enough, off to the river. I found a gate through the fence between us and the river and found that I could pick my way through shallow, though quite swiftly flowing water, to the far side. My first customer was on the near side, though, and proved to be a Sri Lankan endemic: the Sri Lanka Shining Gossamerwing (Euphaea splendens) though I managed only a very average picture (too slow a shutter speed – not concentrating). Regrettably I didn’t see it again to correct my mistake. I had much more luck on the far side, though. Here I spotted what looked like a Clubtail/Gomphid fly up and settle above my head. Struggling, I did finally get a half-way decent vantage point and snagged another endemic with the complex name of Sri Lanka Wijaya’s Scissortail (Microgomphus wijaya). This last is classed as endangered and rare so I was very happy to have seen it. I saw five species altogether. 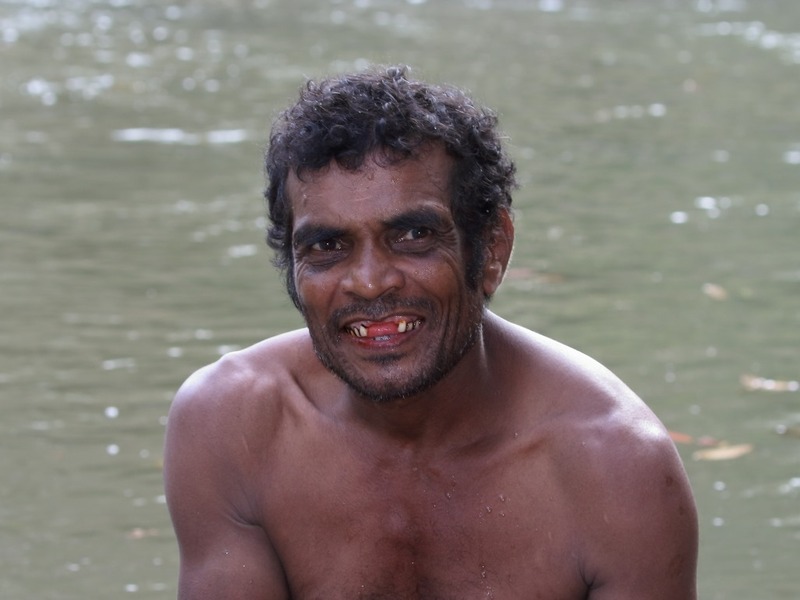 A man had arrived in the river doing his washing, accompanied by his son who ran and splashed about very energetically. Sri Lankans generally like to be photographed and these two were no exception. I obliged but the boy was moving too fast and most shots were blurred. His father, though, was much more successful when I eventually encouraged an endearing smile from him. I returned for a long-desired beer. Francine and a companion were beside the pool where I learned that the beer was not exactly cold. Well, there’s a surprise. What is it with this country and beer; they just don’t get it. There is clearly refrigeration to keep the food fresh but the beer seems to take a back seat. One of the managers saw me with my camera and was keen to show me a bird that he’d spotted. I dutifully followed. The bird had, of course, done a runner – well, flapper – but eventually reappeared. 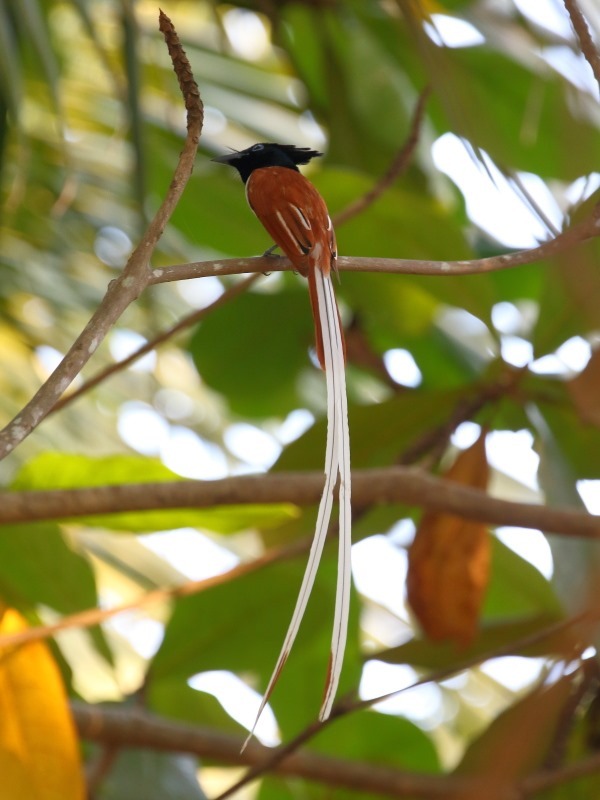 I got a picture, of sorts, just good enough to see that it is a most unlikely looking flycatcher with an enormously long, streaming tail, the Ceylon Paradise Flycatcher (Terpsiphone paradisi ceylonensis). At our evening meal, which was a barbecue together with the frequently seen array of curries and accompaniments, someone overheard the leader of a large German group saying, “my group drinks lots of cold beer; you’d better put more in the chiller”. That’s all well and good but it needs to be in the chiller at least an hour ahead of time. I managed to get a reasonably cool beer to wash down my BBQ. Time to try and deploy the mosquito nets. Given the heat and humidity, separate beds were appealing but when we tried to deploy a net over one of the two single beds, it looked as if the net would’ve been dangling across ones face all night – not a recipe for restful sleep. The problem was that the support frame was rather too narrow to hold the net out and away, sufficiently. The double bed’s net had a much wider mosquito net frame and looked more successful. We opted for the double. Besides, it was nearer to the electric fan which we stopped oscillating and directed it constantly at us. Somehow, we slept. I never did see or hear a mosquito. Love that bird and the baby elephants’ backs.